Summary: Tamsin is a 17-year-old girl who is the only member of her family not to possess a magical talent, despite the fact she was destined to be one of the greatest witches in the family. 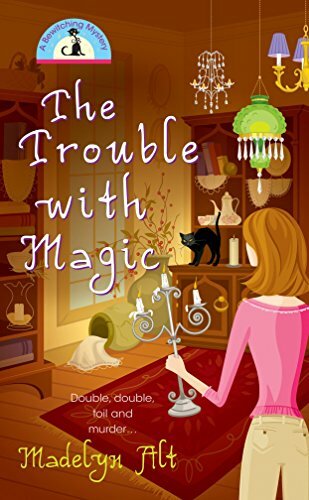 But when a seemingly-normal customer approaches her with a magical request, she agrees to help him find a lost family heirloom because she wants to be someone who has the power to help him. A “talented” friend of the family (who also happens to be a cute guy) agrees to aid her search, but it doesn’t turn out exactly as Tamsin expected. Review: It’s cute – I enjoyed it. While my reading level may be a bit above that of the intended audience, I think most folks will find it a quick, light and relatively-clean read. This book isn’t a deep book in which the inner workings of a witch are unveiled. It’s a book about a girl who simultaneously loves and is annoyed by her family, a girl who enjoys flirting with cute boys, and a girl who is trying to find her niche in the world. The plot moves quickly, and the main character is likable. I would have enjoyed more details about the other characters, but I suspect that a sequel is in the works that aid with that problem.